Credit: Courtesy the Joshua Lawrence Chamberlain Collection, George J. Mitchell Department of Special Collections & Archives, Bowdoin College Library, Brunswick, Maine. In his address Chamberlain mentions General order 100 or Instructions for the Government of Armies of the United States in the Field, today it known as the Lieber Code, it called for humane and ethical treatment of prisoners of war and civilians in occupied areas and forbade the use of torture.2 The Lieber Code, as Chamberlain mentions on page 11, was adopted by the Hague Conventions thus creating the "laws of war" that would govern World War I and World War II. In 1994 local York residents began to have some doubts about this monument. Rick Souza a local who was investigating the matter declared, "There is no question about it: The statue in the center of town is a Confederate soldier." He went on to describe the monument as a "skinny Colonel Sanders. "3 Noting that the monument has an inscription, "To sons of York who served their country in Army and Navy for preservation of the Union." 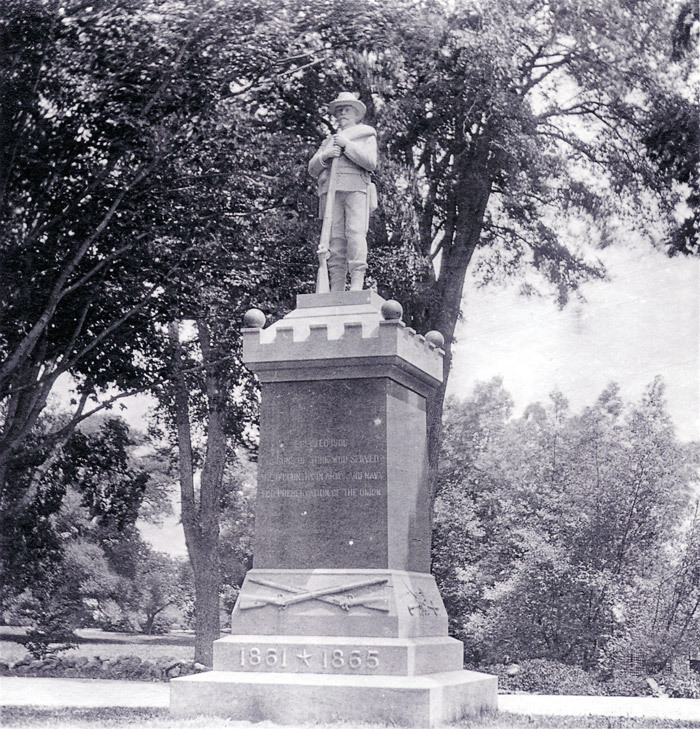 Souza wrote to several Southern towns with "york" in the name, York, Yorkshire or Yorktown, but none reported having a statue of a Union soldier. Though it is somewhat baffling why Souza would imagine a Southern town would inscribe on a Confederate monument, "for preservation of the Union." 2Yale Law School - Lieber code. 4Soldier's garb generates doubts about monument www.seacoastonline.com. Sep. 26, 2004, updated Feb 1, 2011. Accessed Sep. 18, 2014.